Regardless of whether you use the Express Start version or Advanced Setup/EasyStep Interview version of the QuickBooks Setup process, you don’t actually get a complete trial balance into the QuickBooks company file simply by “setting up.” You get only your bank account, accounts receivable, inventory, and accounts payable balances into QuickBooks. Yet you need to enter all of the missing trial balance information into QuickBooks, too, to begin getting good reports out of QuickBooks and to use QuickBooks for supplying financial data to your tax returns. In order to record the rest of your starting trial balance, you record a journal entry. The journal entry records the remaining trial balance amounts for all of your other accounts at the conversion or start date: accounts other than your bank accounts, accounts receivable, accounts payable, and inventory. As a simple example to show you how this works, suppose that you have the trial balance shown in the following table. Please notice that no balance is recorded for a bank account, accounts receivable (this account doesn’t even show up in the trial balance) and no balances are recorded for inventory or accounts payable (because these accounts have zero balances at the conversion date). For purposes of this example, the cash balance is not a bank account but is actually cash: a desk drawer full of low-denomination, used bills with non-sequential serial numbers. Here’s how the Make General Journal Entries window looks when it records the missing trial balance information. 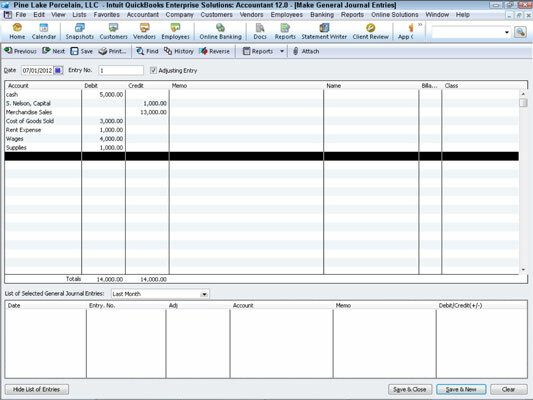 After this journal entry is recorded, the trial balance is correct as of the start date. Choose the Company→Make Journal Entry command. When QuickBooks displays the General Journal Entries window, use the Account, Debit, and Credit columns to record your journal entry. Does the idea of making a journal entry terrify the heck out of you? If so, you may find yourself in a bit of a pickle. You need to become comfortable working with double-entry bookkeeping in order to set up QuickBooks at a time other than at the beginning of the year. This means, unfortunately, that if you are setting up QuickBooks sometime during the middle of the year, you must enter a general journal entry in order to fix the weirdness that the QuickBooks Setup creates. If you don’t know how double-entry bookkeeping works — if debits and credits aren’t your friends — you probably need to get somebody’s help.